Montana's Donavan Dorsey gets fouled by Portland State's Michael Nuga in the first half of Saturday's game. Montana will look to recover from its loss to PSU as it hits the road to take on Eastern Washington on Thursday. 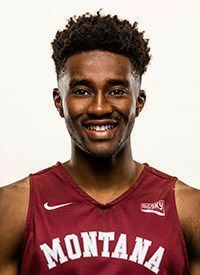 MISSOULA – Understandably so, Montana Grizzlies senior Michael Oguine was pretty upset Sunday morning. UM lost in overtime to Portland State the previous night, snapping a 20-game home winning streak dating back to 2017. The loss was a bummer, but Oguine’s spirits were quickly lifted Sunday afternoon as he was watching the Los Angeles Chargers visit the Baltimore Ravens to begin the NFL Playoffs. Oguine, a Los Angeles native, is about as die-hard a Chargers fan as you can get. So as L.A. was slowly letting its lead slip away, he couldn’t help but feel like he’d seen this before, even tweeting “In the most Chargers way possible…” after the Chargers held on to win. But back to business is the mantra of the Grizzlies this week after letting Saturday’s game go. Montana hits the road once again for a rematch week of last year’s Big Sky Conference tournament semifinals and championship game. UM visits Eastern Washington on Thursday and conference-leading Northern Colorado on Saturday. With Montana winning both games last year, DeCuire sees an opportunity for rivalries to be built. Montana erased an 11-point halftime deficit against EWU in the title game to move on to the NCAA Tournament. In the semifinal against Northern Colorado, the Grizzlies scored six points in the final minute to force overtime and ultimately win. “I love adding a little flavor to each game, and it’s just another reason to get up for it,” DeCuire said. While Montana is off to another hot start this year, the same can't be said for Eastern. The Eagles are 3-12 overall and 1-3 in conference play. EWU opened the season 1-9 and ranks dead last in the Big Sky in scoring offense (66.1 points per game), scoring margin (minus-10.7), field goal percentage (38.9 percent), 3-point defense with teams converting 39.5 percent of their 3s against them and rebounding margin (minus-4.5). The Eagles did lose Bogdan Bliznyuk from last year's team. Bliznyuk became the conference's all-time scoring leader last year with 2,169 points. EWU and UM have two common opponents in North Dakota State and South Dakota State, both of whom the Eagles were defeated by and the Grizzlies beat. However, it’s another tough scheduling run for the Griz. After Thursday night's game, Montana will hop on a plane and head to Greeley, Colorado, and prep for a 2 p.m. tipoff time on Saturday against the Bears, who are 4-0 to start the conference season. “Oh, our conference did us an incredible favor and made sure we play in the afternoon with less than 24 hours turnaround by the time we get to Northern Colorado,” DeCuire deadpanned. “For us it’s one game at a time, stay hungry, and embrace an opportunity to compete. If you’re excited about competing, who cares how much rest you had and how fresh you are. Just go out and make the most of it. The loss to Portland State is serving as extra motivation for this next road trip. A season-high 4,408 fans showed up on Saturday, a fact not lost on the team, so attention to detail and correcting those mistakes are key. But as always the focus is moving on and conquering their second conference road trip of the year. And after they wrap this road trip up, Oguine plans to catch the Chargers taking on the Patriots on Sunday. His prediction?